Previously Keelogyboy in MV. 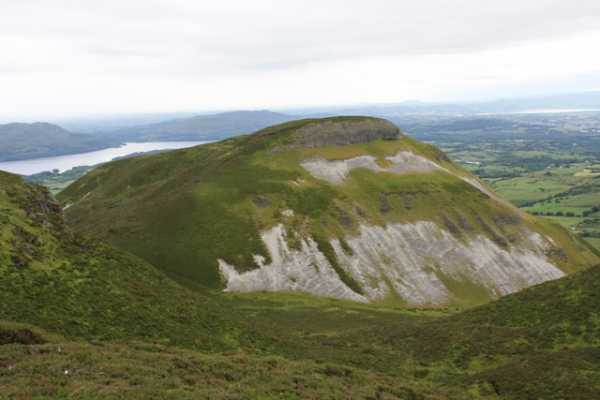 Keelogyboy Mtn SW Top is the 864th highest place in Ireland. Joint longest mountain name in Ireland? If you have reached KMSWT via the gully mentioned by Simon3, it is possible to return to Keelogyboy Mountain by dropping back to the col at G769 386 B and then heading to the left of the cliffs facing you. There is a large heathery re-entrant at G769 389 F that allows a straightforward climb back up to Keelogyboy Mountain. Don’t be fooled by the heathery bog approach to Keelogyboy SW Top. There is a line of sheer drops immediately at the summit just waiting for the unsuspecting walker to step off. If you survive the initial drop, you can look forward to a long slide down a very steep scree slope with further occasional drops and rocks. My photo shows the cliffs, along with the scree slopes, as viewed from the re-entrant mentioned above. This is a fantastic little hill and gives a real sense of thrill that belies its 417 metre height.